Many Christians strive to achieve happiness. Few, however, have understood, much less followed, what the Bible says to get there. Needless to say, they aren't "happy" with the end result. 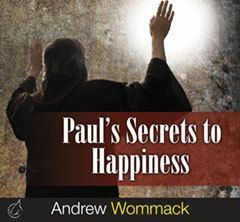 Listen as Andrew shares twenty secrets from Paul's letter to the Philippians that are sure to get you on the path to happiness.